The West Georgia Wolves improved to 2-0 last Saturday after a 33-7 win over the Miles Golden Bears as a crowd of nearly 8,000 looked on at University Stadium. The atmosphere was electric with the best Wolf Walk I, personally, have ever seen. Coach Hall was up at the tailgate 15 minutes before kickoff getting all fans pumped and ready to go. It truly is something else, the passion Will Hall has for his program at UWG, and it feels great to be a part of it. The offense amassed an amazing 457 yards, 230 coming on the ground and 227 in the air. UWG came into the game ranked #3 in the country, but after a Colorado-St Pueblo Loss, the team that knocked off the Wolves last year in the semi-finals, they moved into the #2 spot in the country Sunday morning, something that UWG has never achieved in the division 2 era. Freshman Aares McCall out of Grayson, Ga had another 100 yard rushing performance to give him 208 rushing yards on the year. McCall could not seem to find the end zone last week vs Catawba, but Saturday he found the end zone for his first collegiate touchdown. Quarterback Dallas Dickey had another noteworthy performance, going 14-22 in the air along with a passing touchdown and 214 yards. Unlike last week, Dickey did throw an interception Saturday. Miles opened up the game with the ball and had a 64-yard completion to move them to West Georgia’s 16 yard line, but the grueling defense of the Wolves forced the Golden Bears to a field goal attempt that was no good. West Georgia then took over on their own 20, and Dickey led the offense down the field on a nine play, 68-yard drive that ended in a 29-yard UWG field goal by Hunter Heck. This gave the Wolves a 3-0 lead with 9:29 left in the first. Aares McCall looks for a hole in the defense Saturday in UWG’s 33-7 win over Miles. After the defense of the Wolves forced a three-and-out, they received excellent field position at the Miles 47 yard line. This time, the Wolves pushed all the way to the Miles four yard line before being forced to kick another field goal. After this successful 21-yard attempt by Heck, the score was 6-0 in favor of the Wolves as the first quarter ended. The second quarter began with another strong showing by the UWG defense, forcing another three-and-out. This time, it only took the Wolves 4 plays to find the end zone for the first touchdown of the day. Dickey finished this drive with a 25-yard touchdown pass to Devontae Jackson. After a successful 2-point conversion, UWG was up 14-0. Miles then made it down to the red zone, but was picked off by sophomore safety Zed Brown on the 10 yard line. Throughout the next 10 minutes, neither team would score. The Wolves opened up the second half with a three-and-out of their own, in which Miles would capitalize. The Golden Bears drove 56 yards in seven plays, eventually finding the end zone on a 15-yard pass from David Whipple to Delarius Webb. After this score and successful PAT, the Wolves only found them up 7 points with 8:42 left in the third. Only four minutes later, Hunter Heck put the Wolves on the board yet again with his third field goal of the day, this time from 37 yards. This gave the Wolves a 10-point lead with 4:01 left in the third. The UWG offense then found themselves with the ball yet again after the defense forced Miles to punt. 8 plays and 51 yards later, they were up 24-7 after a 27-yard scamper by McCall. With 13:07 left to play in the game, the defense would put up some points of their own by way of a safety, making the score 26-7. It seemed now that the Wolves had this game wrapped up, so Will Garret came in for relief of Dallas Dickey. Garrett looked good again in his time on the field, leading West Georgia down the field on a nine-play, 48 yard drive. Devontae Jackson ran it in from 12 yards out for his second score of the day, which was the final points of the game. It seems the Wolves have it going on offense, with Jackson and McCall having huge days. Jackson finished the day with 82 rushing yards and a score as well as a score through the air. Not only that, but redshirt Freshman Will Garrett has looked excellent in the first two games, when he has taken the field. It looks as if the Wolves have a bright future on offense with their leading rusher being a freshman, and their backup quarterback getting this useful experience. The defense was excellent Saturday, only giving up 215 yards and one touchdown, as well as putting up their first points of the season with a safety. They were phenomenal on third down yet again, only allowing the Golden Bears to convert on 4 of 14 attempts. Gabe Freeman, whose season ended early last year with a knee injury, led the team with 7 tackles. It’s great to see him back out there on the field after missing out on the 2014 playoff run. Dylan Donahue had 5 tackles as well as one sack, and was responsible for the intentional grounding penalty which resulted in the safety. The secondary had another strong showing, producing an interception and holding the opposing team to under 100 passing yards for the second consecutive week. Lorenzo Ford, a vital part of the UWG defense, takes down Earnest Bell Saturday in UWG’s 33-7 win over Miles. 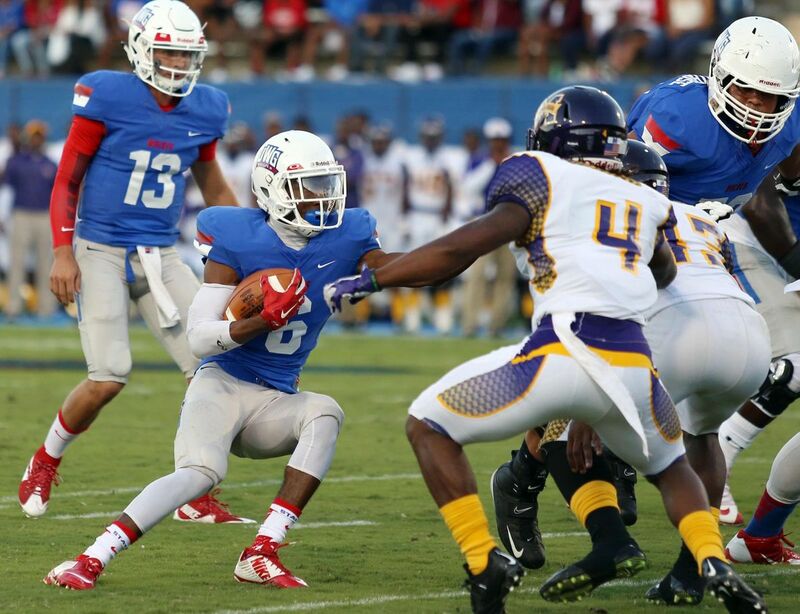 The UWG defense found themselves ranked back in the top ten, a familiar place for them. Last year, they were in the top ten the majority of the season. They will come in Saturday ranked 5th in the nation in total defense, only allowing 19 first downs in two games. Fayetteville State visits Carrollton this Saturday in their first ever trip to University Stadium. They will come into the game 0-2 after a 41-31 loss to Chowan in week 1, and a 14-10 loss to UNC Pembroke last week. The Broncos have not looked great this season, and UWG should be able to handle them. They have an excellent safety in Travis Scales, who had 13 tackles last week as well as an interception. Look for Dickey and the Wolves to form a game plan around Scales, and come out strong against the weaker Fayetteville State Broncos. I expect the Wolves to win by 2-3 touchdowns Saturday, and improve to 3-0 on the year.